Cyncerely yours: A healthy dessert! 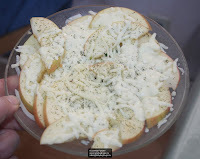 Apples, cheese and dill weed. A healthy dessert! Apples, cheese and dill weed. A forgiving dessert when one needs crunch and cheese. The Dill Weed adds a slight tang to the whole affair. A lady I knew once had me try apples with cheese. Its been a favorite ever since. In moderation, its even healthy :) Its almost like eating apple sauce in an apple with a bit of cheese on top. Slice apple evenly, about 1/4" thick. Place in a microwave safe plate so that no slices sit atop each other. (you can add as much dill weed as you like, whatever your preference is). Cook in microwave for 20 seconds. Check to see if cheese has melted, or is starting to. Cook in 15 seconds increments until cheese starts to melt and be bubbly (see picture). Please be careful, some of the apples will be piping hot! This is awesome with a glass of ice cold milk, and I enjoy this little treat when I am missing for that elusive "something" that keeps me from being satisfied, even after a full meal. The crunch of the apple, the sweetness of it, along with the slight saltiness of the cheese and tang of the dill weed always put my tastebuds to rest. Pasta Arrabiata Sauce, and Bake too! OAMC- what in the world you ask?